A dashing new arrival has been spotted in the form of a horizontal bar under the four digit year. 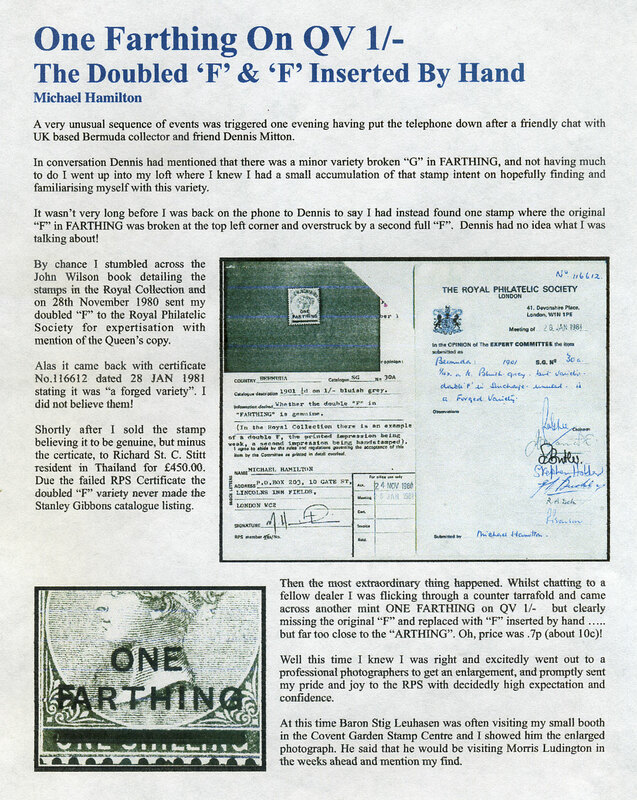 Its purpose is probably meaningless but collectors might like to report dated sightings both with and without. 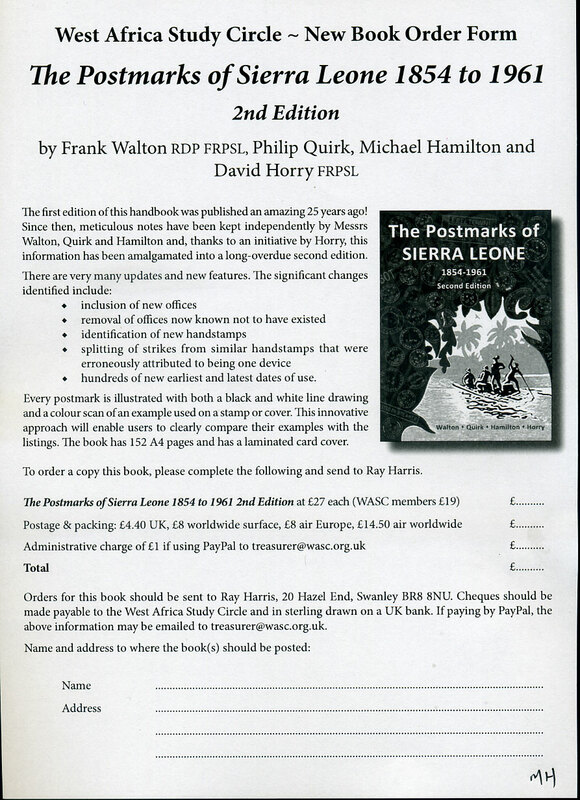 16th July 2015 – the new Frank Walton SIERRA LEONE postmarks handbook is with the printers. If you click on my blue “Subjects” and scroll down to “Walton illustrated” you will find postmarks on stamps actually illustrated in this new and essential book. Its quite fulfilling leafing through the pages and thinking “that’s mine!”. More “Walton illustrated” will be added over the coming weeks. JAMAICA: REGINALD BRAY and his antics! The attached article was written for the British West Indies Study Circle journal and appeared in the June 2015 issue. 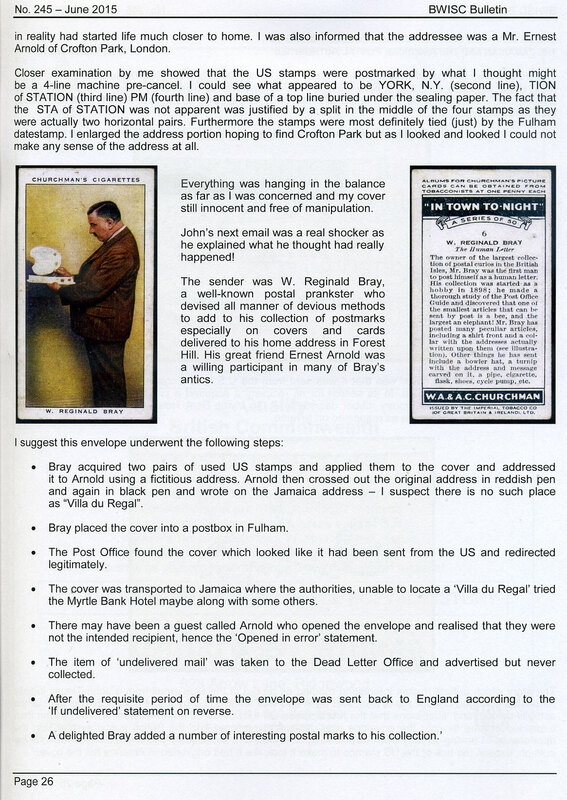 John Tingey has his article on this cover scheduled for the August 2015 edition of "Stamp & Coin Mart" written in the form of an Arthur Conan Doyle "whodunnit" (should go on sale approx. 12th July). 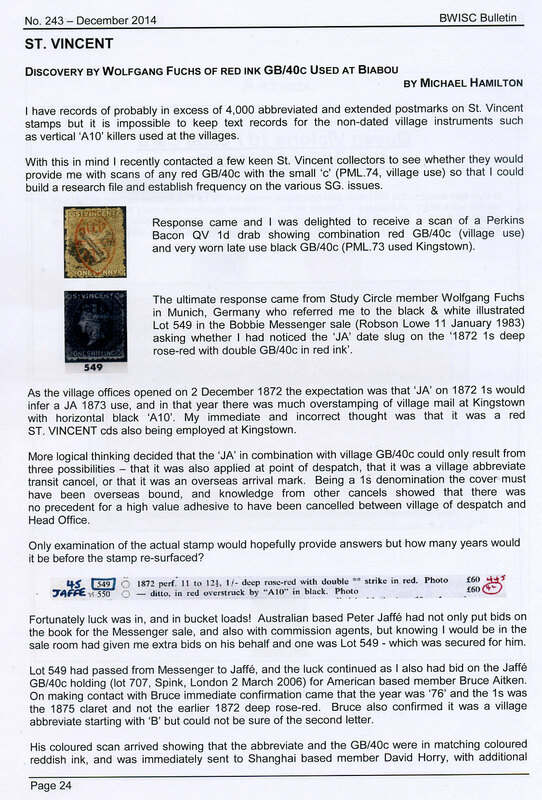 The attached reports the discovery by Wolfgang Fuchs of Munich of red ink GB/40c used at Biabou, written up for the British West Indies Study Circle journal. 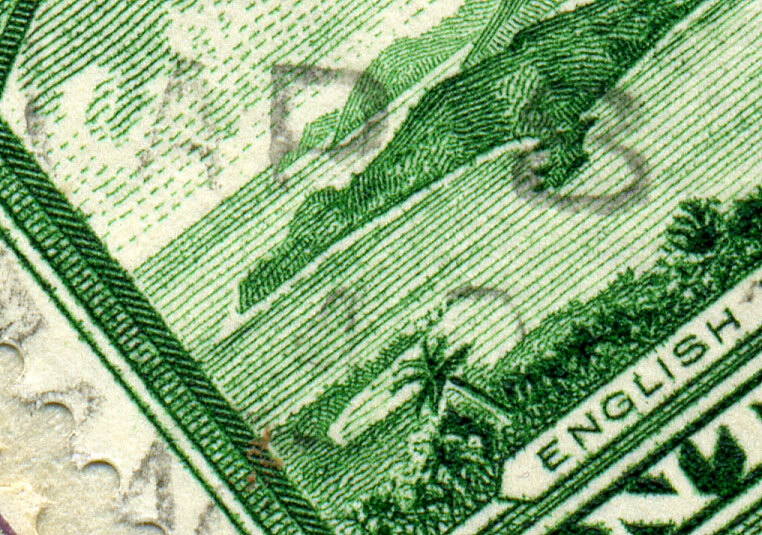 My understanding is that this was printed by De La Rue on yellowish-white paper with overlay in bluish-grey. 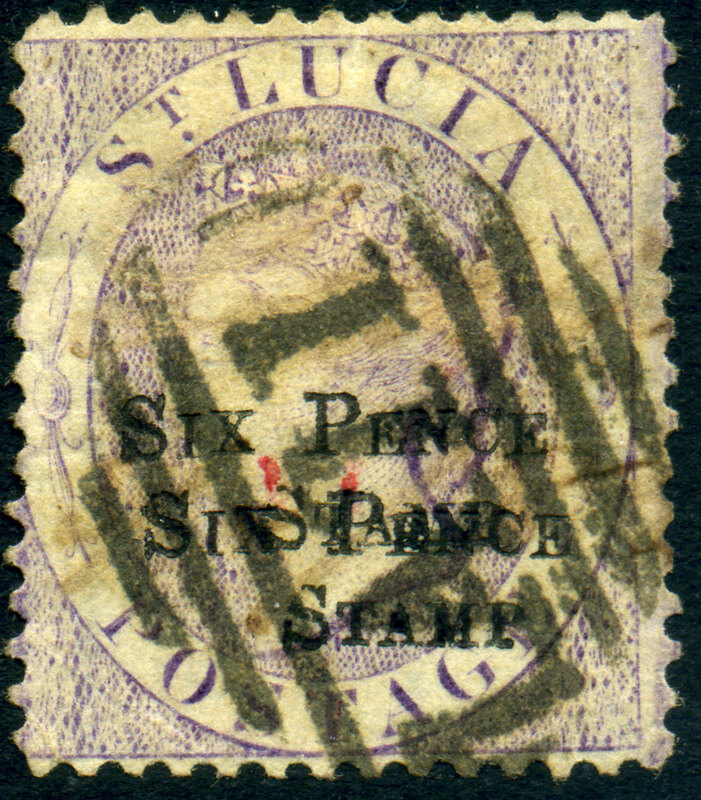 The 6d stamp depicting Priestman's River is printed in purple (shades). There are three settings. 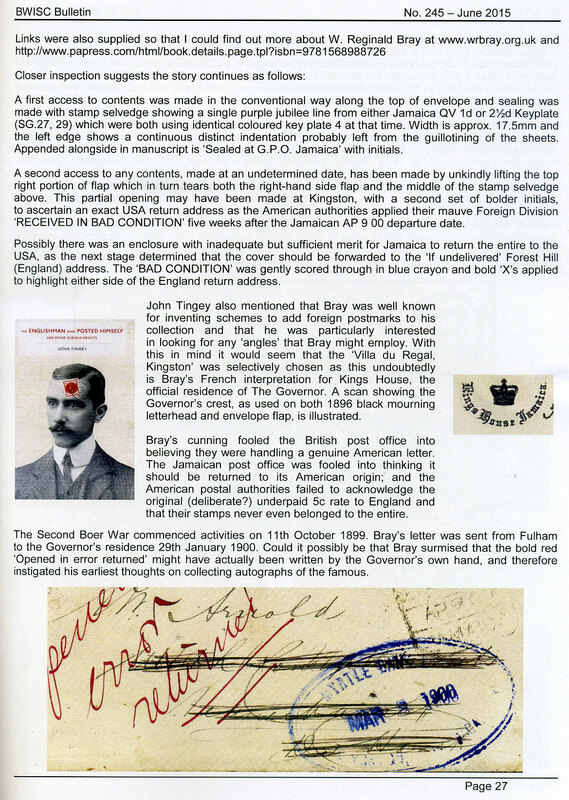 First, which includes forms overprinted SPECIMEN in black, has no dot between Y and T of ANYTHING and no dot before E of ENCLOSED in the 3-line warning. The second setting has the dot between Y and T only, and the third setting has both the dot between Y and T and the dot before E. The third setting was used from mid-1950 until 1954. 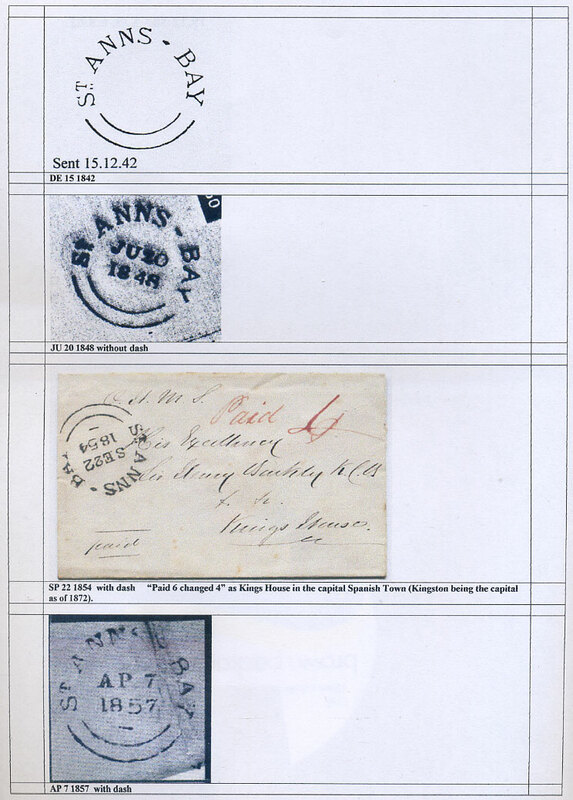 The attached scans are both third setting form, one MISSING PRIESTMAN'S RIVER STAMP IN PURPLE COLOUR. 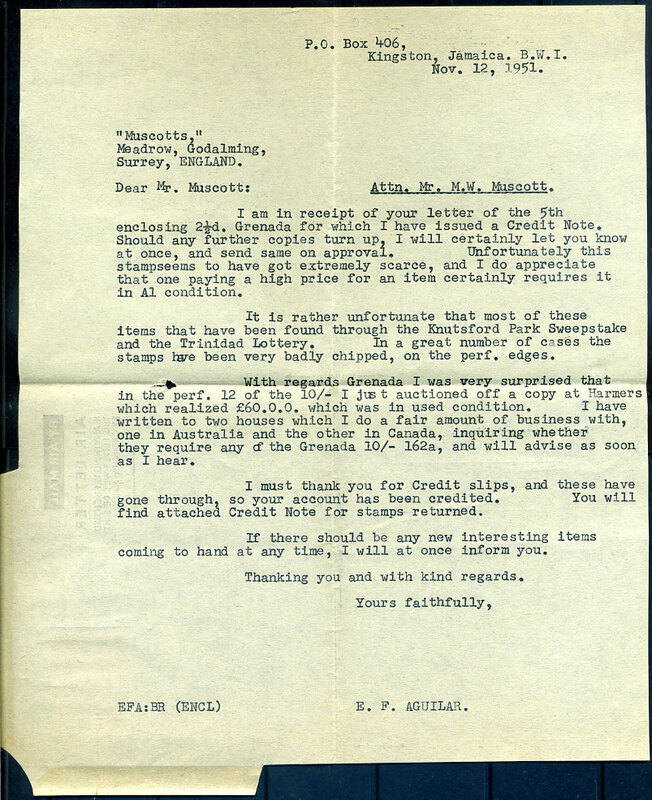 The form has typewritten commercial letter from E. F. Aguilar to Muscotts dated Nov. 12, 1951. Tom Foster in his Jamaica Newsletter No. 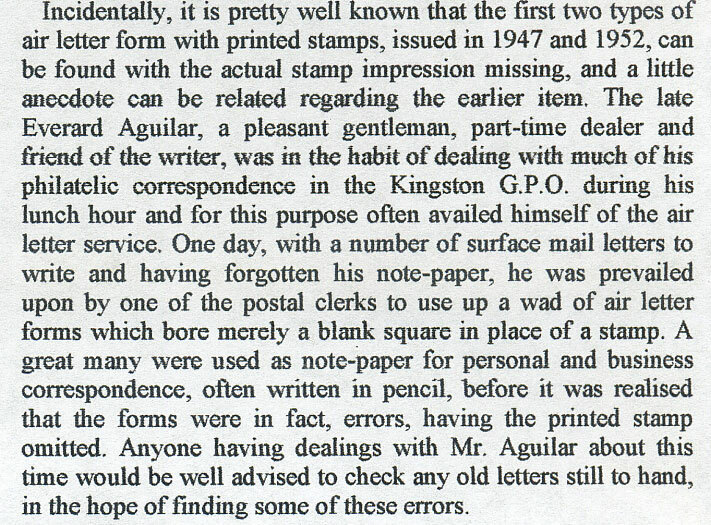 15 explains that Aguilar was in the habit of dealing with much of his philatelic correspondence at the Kingston G.P.O. during his lunch hour. 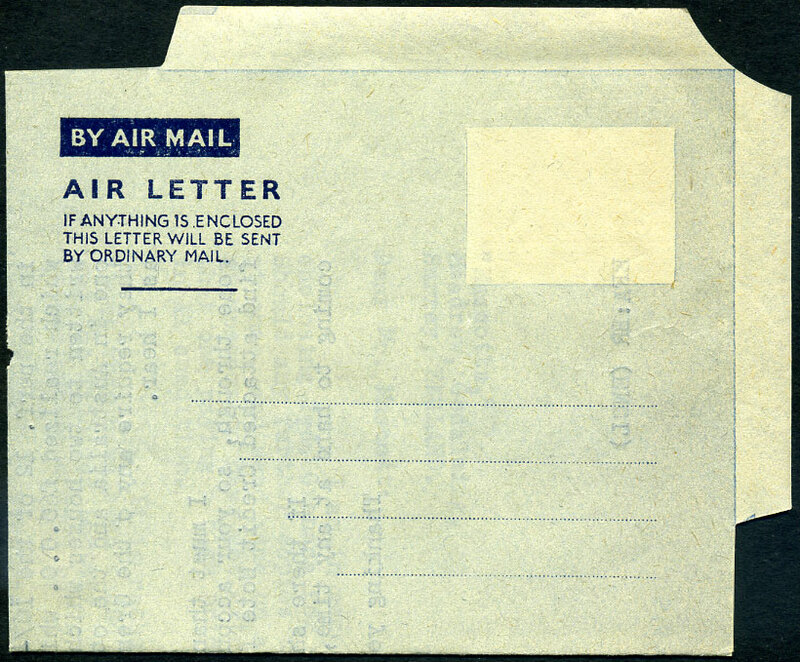 On one ocassion, having forgotten his notebook, a postal clerk gave him a wad of blank Air Letter forms which merely bore a blank square in place of a stamp. Many were used as note-paper for personal and business correspondence, often written in pencil, before it was realised they were ERROR forms. What is not explained is what happened next! Were the forms allowed to be removed from the G.P.O. Does anyone have error forms with pencil notes on them, have other typewritten, but not posted, error forms survived? Are there error forms from the third setting mailed with actual adhesive? Sightings and comments appreciated. This announcement leaflet was included in CAMEO (The Journal of the West Africa Study Circle, June 2015 edition) received by me today 23rd June 2015. The book should be ordered now but its not quite at the printers yet. 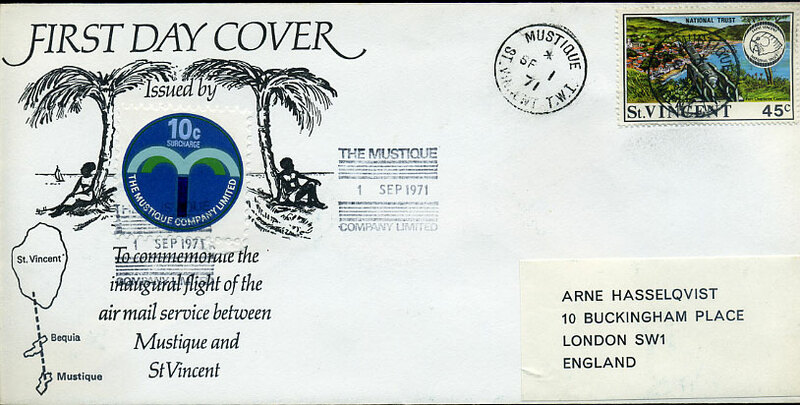 This cover has a reluctance to show year of posting clearly, but as 40 and 42 would require censorship it would seem to have been posted at St. John's, Antigua A/AP 8 49. 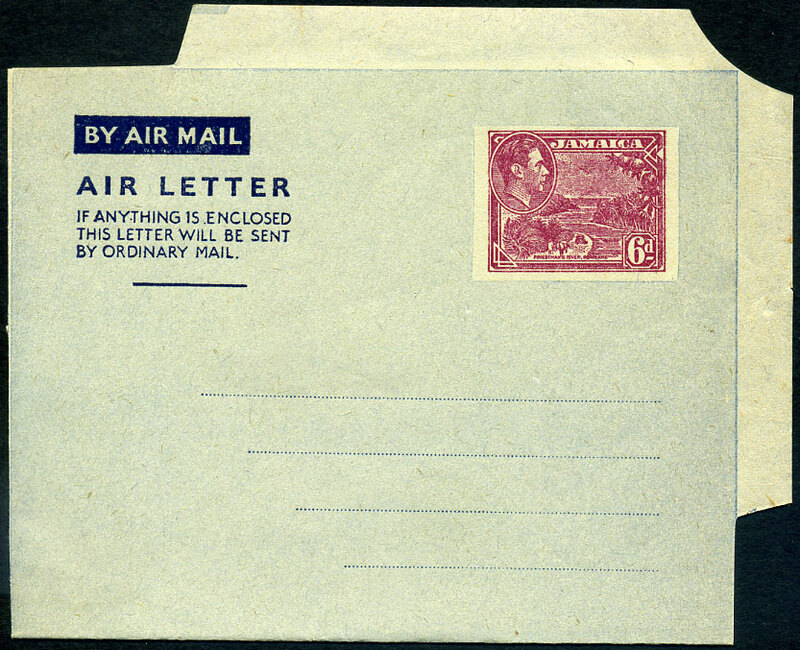 The reverse has no transit or arrival cancels and just has a "Mrs. A Forrest, Antigua" sender's address. 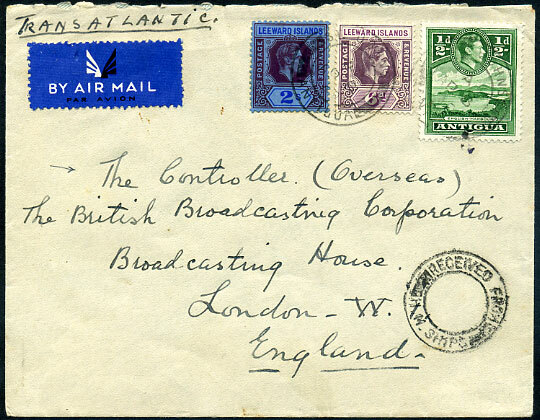 The airmail rate of 2/6½d is correct but why is there a handstruck RECEIVED FROM H.M. SHIPS? Your thoughts appreciated. 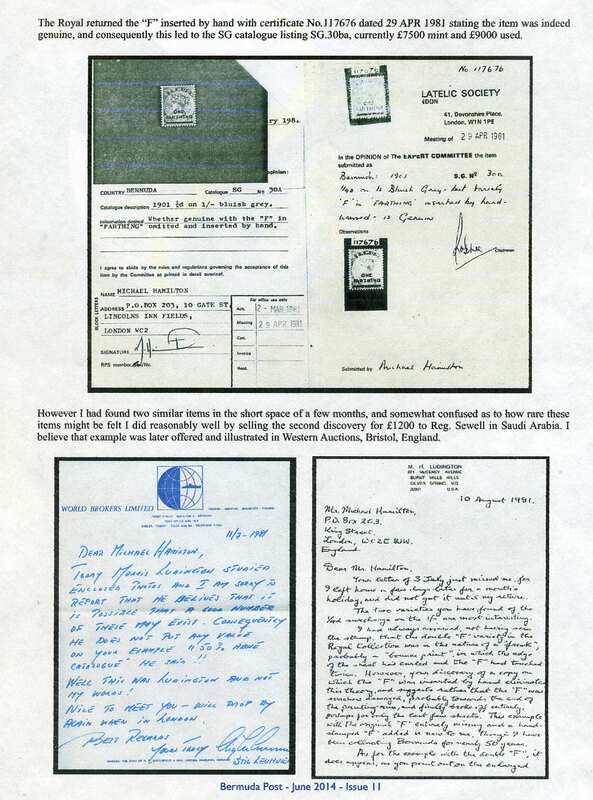 I attach scans of the examples currently known to me. All appear on the 1880 QV 1d olive-green (SG.29), only one is dated having the abbreviated "CA" (used Calliaqua) JY 30 81. If you can provide scans of further examples please do so. I use Adobe photoshop and prefer small scans in perfect upright position (preferably against black background). I normally scan in Professional at 200 dpi and 50% ... they need to fit in the boxes!!! Thanks. I have a reluctance to put certain items in for a Certificate as you are either stuck with a yes or a no! If you were going to forge this DOUBLE SURCHARGE you would think of perhaps chosing a better stamp! 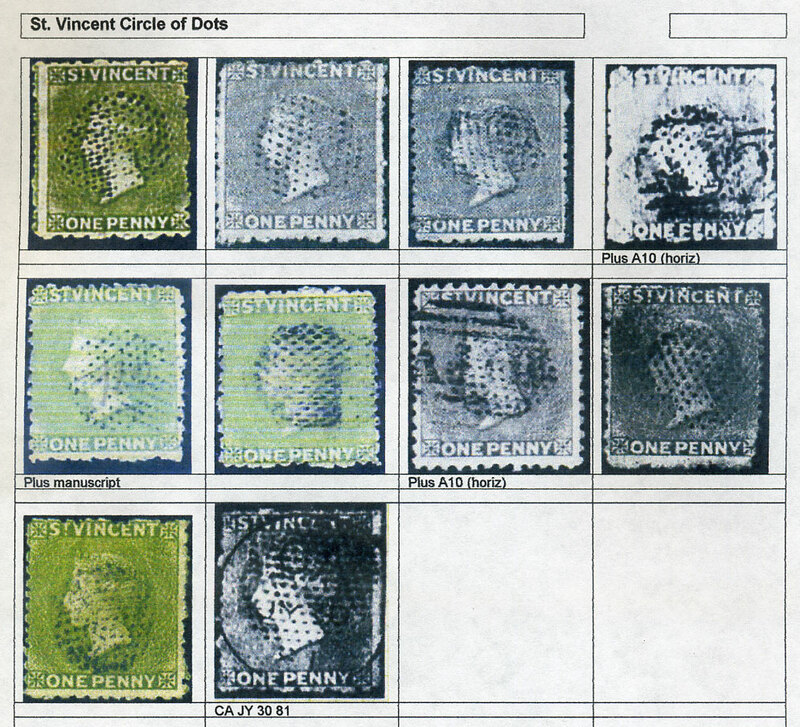 Obviously it has manuscript cleaned and SG state "Many used examples of the Postal Fiscal stamps have had pen cancellations removed before being used postally". St. Lucia joined the U.P.U. 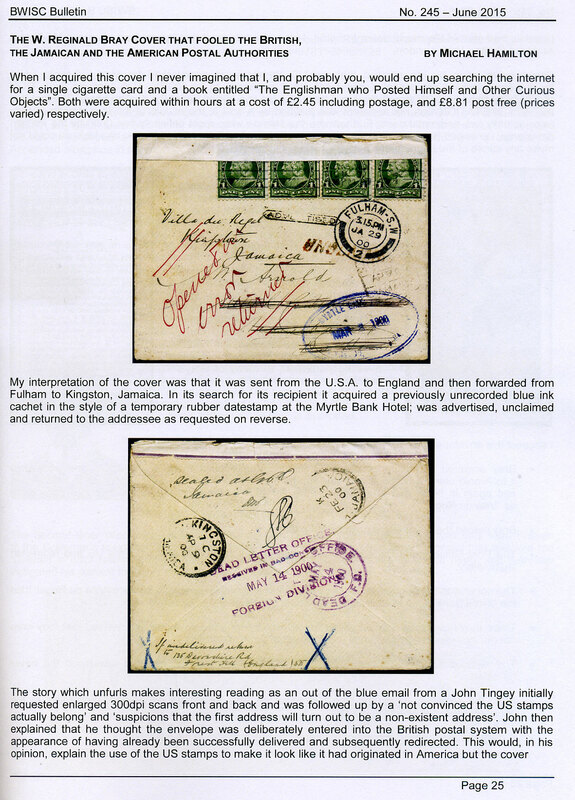 January 1st 1881 and the postal rate to other full member countries was 4d. However there appeared to be a need for higher values as 6d and 1/- denominations were produced. 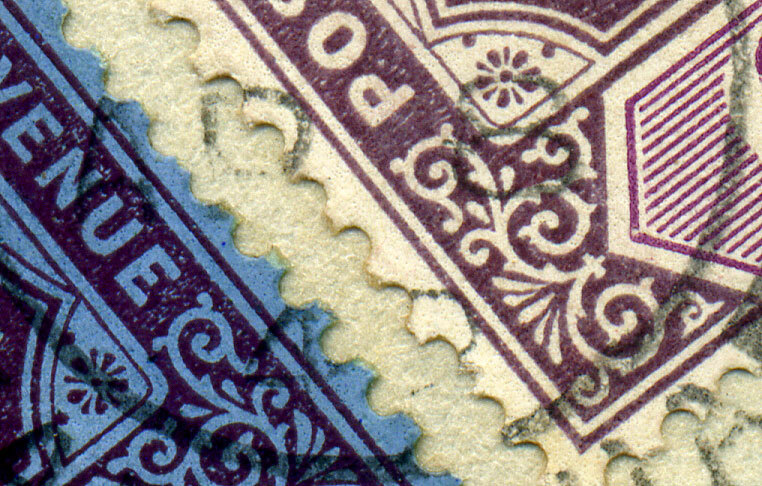 I cannot see any plate flaw on the basic stamp to position, and as multiples of this QV 6d postal fiscal do not exist, one assumes that every stamp will have different characteristics in the overprint. This stamp clearly has matching broken top to "S" in STAMP but it would if it was a forgery, and it would if it was genuine! What about the "A11" cancel, forgery or genuine? Your thoughts are welcomed. 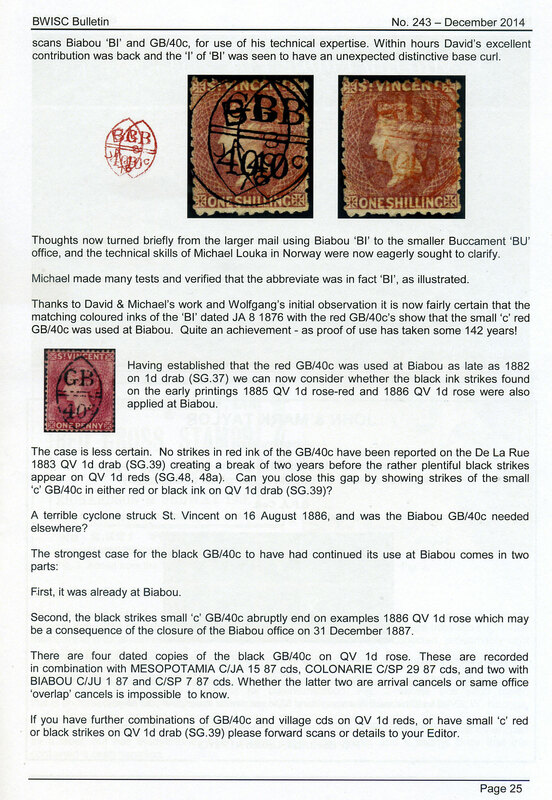 My only references to the four labels (produced in orange, blue, yellow, and mauve) comes from an article in the British West Indies Study Circle Bulletin No.72, March 1972), and the pricing of flight covers and printing quantites as listed after St. Vincent Grenadines in the old Urch Harris catalogues. If you have any additional information, or have mint labels, I would be interested in scans etc.